Attractive semi-detached holiday villa with shared swimming pool (there are 8 similar villas sharing the pool). 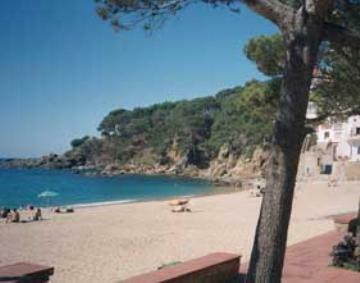 Well located just 1km from the beach and 900 metres from the shops and restaurants in Llafranc. The accommodation comprises a light and airy living and dining room with fireplace. Fully equipped kitchen with oven, microwave, hob, dishwasher etc. Two double bedrooms (1 x 140cm wide bed in each) and a bunk bedroom (2 x 80cm wide bunk beds). Two bathrooms. The villa is really nice with modern, likeable furniture and fittings which lend themselves well to holiday accommodation. The décor is good and the equipment standard high and practical. There is a nice garden with lawn and pool, trees and flowers along with a terrace and garden furniture. Property made available in good order and fully equipped. Local taxes (unless specified otherwise in the villa description), reasonable consumption of services including water, gas and electricity. Garden and swimming pool maintenance. Change-over day is Saturday, arrival time 17.00 – 20.00, departure by 09.30. Refundable deposit payable locally in cash 300€. Linen is available for hire on request 7€ per person and payable locally, same for towels 6€ per person. Obligatory final clean paid locally 87€. Heating for the house. Additional services (where available) including cleaning, babysitting and cooking. Cots available for hire 33€ per week. Pet supplement 33€ per week.